"Combining behavior modification and massage is a brilliant idea." ~ Fearful, reactive or aggressive towards people and or dogs? ~ Stressed and unable to focus in new or distracting environments? Daily walks, having guests in your home, or going to the vet? While it is included as a pdf with the DVD, to save the ink cartridges of those who prefer to read offline: The TACT Companion Workbook is available as a printed workbook (115 pages). TACT, Touch Associated Clicker Training creatively combines the science and art of learning theory, clicker training and massage therapy. This unique approach is used specifically to rehabilitate and prevent shy, fearful, reactive, and aggressive behavior in dogs and puppies utilizing positive training methods. Who Will Benefit from TACT? TACT is beneficial for all dogs, including puppies, shy dogs, and shelter dogs. One application where TACT has found great success is the prevention and rehabilitation of reactive or aggressive canine behavior directed at people. The TACT DVD presentation focuses on the effectiveness of applying TACT to instances of dog reactive or aggressive behavior directed at humans. Desensitizes a dog's fear of people and new environments. Builds confidence and coping skills. Provides structure, bringing predictability to the dog's life. Devlops or deepens the canine/human relationship. 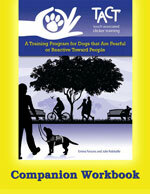 Teaches owners how to recognize canine body language and how to use this knowledge to set their dog up for success. Provides the tools necessary to implement an effective home and real world management program. Develops a two-way communication system between dog/handler. Enlists pet owners to become part of the solution in a creative and fun manner. 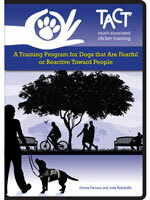 Becomes an effective tool in the canine professional's behavior modification toolbox. TACT's Caregivers Fatigue program provides owners and trainers alike with a plan for healthy self-care. TACT Founder Julie Robitaille recently presented a webinar for Dog IBox. This three hour webinar includes many video demonstrations. The full recording of this webinar is now available for sale on the Dog IBox website for the reasonable price of $24.00 for Dog IBox members and $36.00 for non-members. 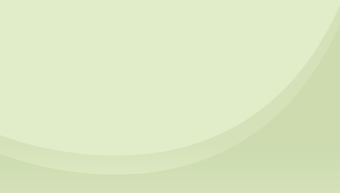 Click here to see all our webinar recordings available for purchase. Thank you New England Federation of Humane Societies and IAABC! Two wonderful conferences. It was a real honor to be asked to present for these organizations. See more conference photos on the TACT Facebook Page.